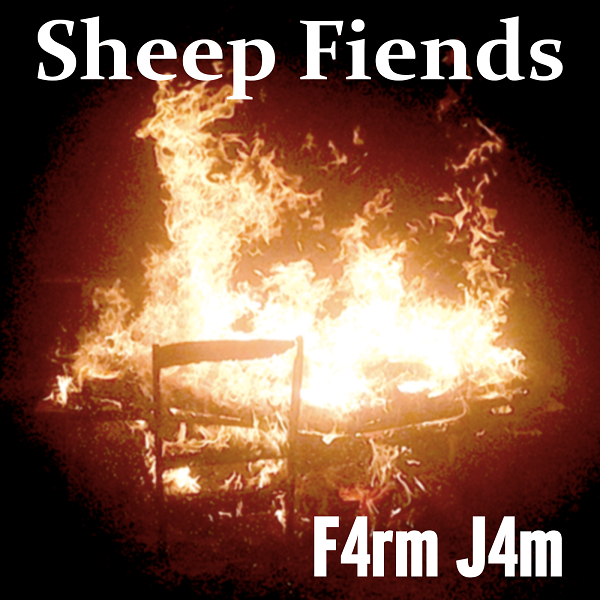 This Sheep Fiends recording was made over a 3 day period and was recorded in a garage in western Pennsylvania. 1: Be Here Alone (4:24) Rating: 4 Lyrics by: Sid Prise Record date: 05/25/2014 DDD digital multitrack recording by Brian Cameron Copyright © 2014 The Sheep Fiends Foundation. 2: Shame Disintegrates In The Presence Of Oxygen (7:25) Rating: 5 Lyrics by: Matthew Cramer Record date: 05/24/2014 DDD digital multitrack recording by Brian McNally Copyright © 2014 The Sheep Fiends Foundation. 3: To Keep Us Mad (8:17) Rating: 5 Lyrics by: Sid Prise Record date: 05/24/2014 DDD digital multitrack recording by Brian Cameron Copyright © 2014 The Sheep Fiends Foundation. 4: Surfin' Saturation (3:48) Rating: 4 Record date: 05/24/2014 DDD digital multitrack recording by Brian Cameron Copyright © 2014 The Sheep Fiends Foundation. 5: Sick Of Myself (3:14) Rating: 5 Copyright: © 1995, Matthew Sweet Lyrics by: Matthew Sweet Record date: 05/25/2014 DDD digital multitrack recording by Brian Cameron Copyright © 2014 The Sheep Fiends Foundation. Note: The mandolin lead, the vocals and Brian Cameron's guitar is overdubbed. 6: Mercy Baby (2:44) Rating: 4 Lyrics by: Mark Armantrout Record date: 05/24/2014 DDD digital multitrack recording by Brian Cameron Copyright © 2014 The Sheep Fiends Foundation. Note: Originally Mark only sang the refrain once, so additional vocals were overdubbed. 7: It's A Bird (3:03) Rating: 4 Lyrics by: Matthew Cramer Record date: 05/25/2014 DDD digital multitrack recording by Brian Cameron Copyright © 2014 The Sheep Fiends Foundation. Note: The bass guitar was overdubbed. 8: Won't Sing That Song Anymore (4:33) Rating: 4 Lyrics by: Sid Prise Record date: 05/25/2014 DDD digital multitrack recording by Brian Cameron Copyright © 2014 The Sheep Fiends Foundation. 9: Garden At Night (6:25) Rating: 4 Lyrics by: Matthew Cramer Record date: 05/24/2014 DDD digital multitrack recording by Brian Cameron Copyright © 2014 The Sheep Fiends Foundation. 10: Give It Up (7:08) Rating: 5 Lyrics by: Sid Prise Record date: 05/25/2014 DDD digital multitrack recording by Brian Cameron Copyright © 2014 The Sheep Fiends Foundation. 11: There's Going To Be A Fight: Chicago Noir (11:35) Rating: 5 Lyrics by: Matthew Cramer Record date: 05/25/2014 DDD digital multitrack recording by Brian Cameron Copyright © 2014 The Sheep Fiends Foundation. Note: Most of the vocals were overdubbed, aside from some vocals in French that were recorded initially. 12: Dreaming Of Everything (5:17) Rating: 4 Record date: 05/24/2014 DDD digital multitrack recording by Brian McNally Copyright © 2014 The Sheep Fiends Foundation. Note: Aaron's guitar playing was overdubbed.